Celebrity Light Goat Cheese is made with the same 100% local, rGHB free, farm-fresh goat’s milk as Celebrity’s Original Plain Goat Cheese and has the same soft, silky, award-winning taste, but-- with over 30% less fat. Located in Lindsay, Ontario, Mariposa is the family owned and operated dairy that produces the artisan, handcrafted Celebrity Goat Cheese line. Mariposa goats are fed a specialized high-energy, high-protein diet of roasted soybeans, which results in exceptional quality milk. Goats convert all carotene in their diet to vitamin A, leaving their milk and cream pure white. Goat’s milk is lower in fat and cholesterol and higher in calcium and Vitamins A and D than cow’s milk, making Celebrity Light Goat Cheese a great option for a health conscious diet and/or for the lactose intolerant. The Celebrity brand furthers the health benefits of goat’s milk cheese by solely using sea salt, which not only brings out the delicate flavor of the milk but also doesn't add unwanted iodine. 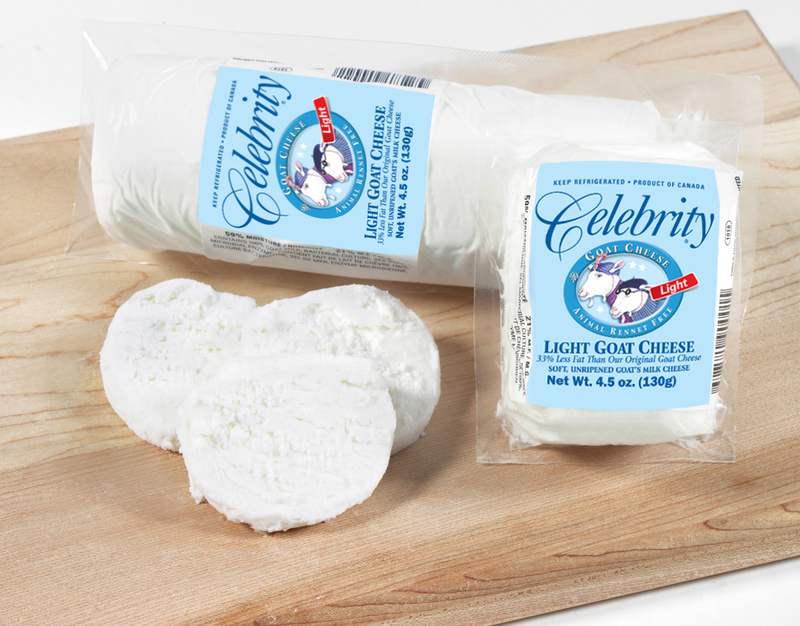 Celebrity Light Goat Cheese has a deliciously fresh, herbaceous flavor with the slightly sharp and clean finish of traditional goat cheese. Celebrity’s all-natural goat’s milk logs are also COR kosher and Halal certified, suitable for vegetarians and are gluten free. Application: Celebrity Light Goat Cheese is delicious simply spread on crusty bread and crackers or used in bruschetta, salads, omelets, grilled vegetables, pizza, creamed potato dishes and stuffings (to name just a few of the wide range of cooking applications). Pairings: The classic pairing is Sauvignon Blanc but a Belgian-style Witbier would also be a great match for goat cheese. Duhaime Gourmet, located in Québec, Canada, has three generations of passionate food innovators behind its current cheese-spread success. Duhaime’s Orange & Cranberry Fruit Spread is 100% natural, with no added artificial flavors, preservatives or colorants. An authentic taste sweetened only with organic sugar and pure maple syrup, these all-natural fruit-based chutneys are a great way to get your taste buds tingling. 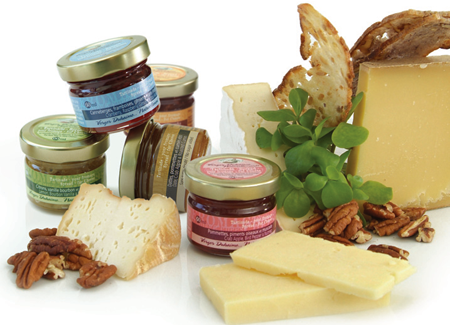 Each flavor is specially combine to complement cheeses. This particular tart sauce is created through a fusion of sweet cranberries with citrusy, tart oranges. This unique blend goes most especially well with soft cheeses such as Celebrity Light Goat. Duhaime’s Orange & Cranberry Topping makes a chic, flavorful impression at any gathering.